Stranger things do happen and this week's round just proved them. Two more singers were sent packing and while I completely expected the eliminations, it's still a sore subject when it finally happens. Season underdog Cece Frey was the first to get the boot with the round's lowest votes and perennial second chance Diamond White followed next soon after. Both have reached the bottom of the leaderboard and sooner or later it was bound to be their time. Only two more weeks until the finals and four more acts are left to fight it out. Let's see if it's a real competition to get to the top! No last minute save can help Diamond now. After landing in the bottom last week, she placed against Fifth Harmony to sing-off and campaign for the judges' votes - needless to say she lost. She did a good alright with her Pepsi challenge ("it's Diamond singing in a diamond! "); many had pegged her to be the next Whitney Houston. However, her performances were constantly on the safe side and never stood out compared to the other contestants. Eventually all the safe performances add up and the votes weren't enough to save her. Carly finally lost her first place momentum to Tate. The "I-don't-need-to-vote-because-she's-safe" approach has reared its ugly head yet again and Carly fell one spot. Both her numbers this week were polarizing: I loved her version of the Justin Bieber song while the Beyonce number didn't stand out. She tends to do a lot of ballads and they do pay off but some of the songs that she chooses tend to be a little dull and repetitive. I would love if she tried something new and different. The rollercoaster has ended and Cece was sent packing. An underdog can only last so long on a show where voting determines the winner. While I did like her on the show, her last performance of "Piece Of Me" didn't impress me and I fully expected her to get voted off. Sad to see her go and it's unfortunate that Demi lost all her contestants. Maybe now that she's eliminated, Cece can reevaluate her career goals, train her voice and come back with a new song. Tate scored the top spot back from Carly this week and I did not see that coming! He's doing well in the competition but it's been very safe and repetitive with the song choices. If it wasn't for his backstory or the fact that he's a country music artist, I don't think he would be a frontrunner. Not my type of thing but oh well... the votes say he could win. The leaderboard may change week-to-week but one thing has stayed constant: the top have stayed at the top. Fifth Harmony, whom haven't cracked the Top 3, landed in the bottom half with the lowest votes. The frankengroup had to compete in the sing-off against Diamond White for the votes and luckily, they survived. The girls have a lot to prove and I'm not sure they'll be here come finale night. 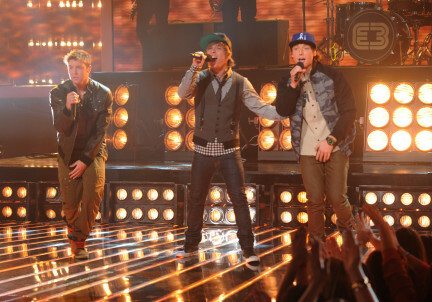 Emblem3 had mixed performances. Their Pepsi challenge was good but the unplugged song... wow, the blonde guy should not sing alone. Many websites had pegged the group to be in risk of elimination but they underestimated the fanbases. The boys held on to the third spot and were safe. My guess is that they'll be in the bottom next week and could face elimination or, if not, will be voted off. Are you sad to see Cece and Diamond gone? Post in the comments and let me know what you thought of this week's round.